Data security is an important aspect of every modern data platform. With micro-service based architectures becoming more of a common pattern across every high-scale app, existing password based authentication mechanisms for user authentication is hard to manage at scale, let alone the fact that passwords are hard to remember or could be cracked. Couchbase Server 5.0 introduced X.509 Certificate authentication for the data service to solve this problem, and Couchbase Server 5.5 adds further enhancements to support all services and interfaces including N1QL, Indexing, XDCR, Search, and even the Couchbase Web UI and REST endpoints. In a nutshell, “authentication” is the process of verifying that a user is who they say they are. In the world of technology this can be achieved in a variety of ways. Certificate based authentication allows users to securely access a server by exchanging a digital certificate instead of a username and password. This means the client is not sending a username or password to the server which helps in preventing phishing, keystroke logging and man-in-the-middle (MITM) attacks among other common problems with password-based authentication. Certificate based authentication is built by leveraging the X.509 public key infrastructure (PKI) standard. Certificate based authentication offers stronger security by mutually authenticating both the client, using a trusted party (the Certificate Authority (CA)) and the server during the TLS handshake. Because the certificate is signed, it is only possible to connect to the real server, and centrally manage the certificates using the CA for rotation or revocation. "path": "subject.CN" "prefix": "couchbase-" "delimiter": "/"
There is a maximum limit of 10 path expressions in Couchbase, with no two expressions having the same path and prefix fields, and it is mandatory to specify all the fields in the expression. Couchbase tries each path expression on the certificate one-by-one in the order specified, and it uses the first one that can successfully extract a non-empty username string. If all the path expressions cannot extract the user string, X.509 certificate authentication will fail. In Couchbase Server 5.5, certificate based authentication is disabled by default, relying instead on local user/pass or LDAP/PAM based authentication methods. When “Require Client Certificate” is set to “Enable”, Couchbase Server will accept the certificate supplied and try to authenticate based it. 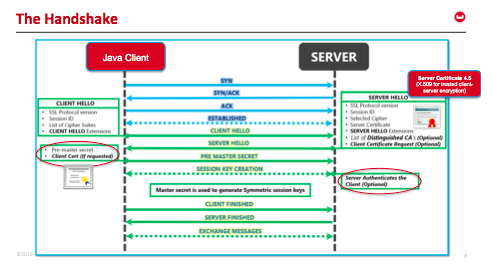 If that fails, Couchbase Server will fall back to user/pass or LDAP/PAM based authentication methods. When “Require Client Certificate” is set to “Mandatory”, a certificate must be provided or else authentication will fail. These settings can also be supplied via the CLI or REST API. Once a user has “authenticated” (they are who they say they are), they still need to be “authorized” which is the process of determining what they are allowed to do. In Couchbase Server this is done by assigning one or more roles to each user. The X.509 certificate based authentication feature is supported by all SDK clients. However, only the very latest versions support it, so check the release notes for your SDK versions. X.509 certificate is the official standard for public key certificates and SSL/TLS relies on this standard. In your client, you must use a valid x.509 certificate that is generated and signed by the same root certificate authority (CA) as the server. Most common web browsers have been supporting client-authentication since the early TLS days. You can configure the client certificate in your browser certificate store and should be good to go! All Couchbase tools such as couchbase-cli, and the N1QL shell are also being updated to support X.509 certificates. Even though it is a bit of work to get this type of authentication setup, it is very secure and simpler to manage at scale. Please download Couchbase Server 5.5 to give it a try. We look forward to your feedback! Useful information. Is MA-SSL supported in Couchbase server 4.5 as well? Hi Vidhya, thanks for your comment! MA-SSL would not be supported before version 5.5 as we did not support _authentication_ via certificates, only encryption.